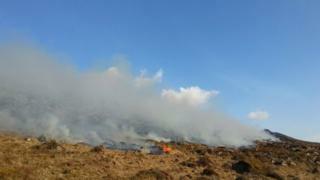 A fire which damaged acres of moorland in Devon on Saturday is one of the largest in years, according to Dartmoor National Park. More than 100 firefighters worked across an area of six square kilometres (1,482 acres) and used beaters to control the fire at Chat Tor, Lydford. The operation was hampered by strong winds fanning the flames. Rob Steemson, the park's head ranger, said the fire was out but monitoring would continue for any "hot spots". Because of the remote location of the blaze, fire engines had to park at the Ministry of Defence's Wilsworthy firing range and Devon and Somerset Fire and Rescue staff were then taken further on to the moor by park rangers. The cause of the fire is unknown, but Mr Steemson told BBC News no legal swailing - a controlled burning of overgrown heathland to clear the ground and encourage new growth - had been approved. It is normally done between October and March, but with prior permission it can be carried out until the second week of April. No swailing is allowed after that date because of the danger to nesting birds. Mr Steemson praised the efforts of Dartmoor "commoners" [people who live and graze livestock on the moor] who used quad bikes and purpose-made mobile extinguishers to help stop the fire spreading over the Rattlebrook River to the highly protected Forest of Dartmoor. The commoners' mobile "fire fogging units" deliver a fine "mist" of water and because of their size can be quickly filled from streams or rivers on the moor. "The eight commoners were quite magnificent and did a sterling job," Mr Steemson added. It is estimated the fire badly damaged about 600 acres of heather and purple moor grass, but it is not known if nesting birds were affected.